The risk of venous thromboembolism (VTE) is very high in trauma patients, secondary to tissue injury, venous status from immobilization, and thrombophilia. As such, early initiation of VTE prophylaxis is essential in this population. The competing risks of life threatening hemorrhage and VTE need to be considered very carefully. Potential approaches to VTE prophylaxis include pharmacologic means, and mechanical devices. For patients unable to receive pharmacologic VTE prophylaxis (due to expanding intracranial hemorrhage, paraspinal hematomas, multiple surgeries, or other reasons), retrievable inferior vena cava filters (rIVCFs) may be placed until low molecular weight heparin (LMWH) can be initiated as a means to prevent development or mitigate the effects of developing pulmonary embolism (PE). The need for effective VTE prophylaxis in patients unable to receive heparin-based products is underscored by Geerts and colleagues’ prospective study on patients not receiving anticoagulation, where 58% of their 349 trauma patients were found to have a deep venous thrombus . Additionally, previous investigations have demonstrated PE formation can occur within 24 hours of traumatic injury [2,3]. Furthermore, more recent literature underscores the risk of withholding pharmacological anticoagulation in trauma patients, as those who had at-least one missed dose of prophylactic LMWH demonstrated a 23.5% rate of VTE development, compared to 4.8% in those with continuous therapy . Currently, guidelines on the use of rIVCFs are contradictory. The Eastern Association for the Surgery of Trauma practice management’s guideline suggests the use of rIVCFs are advisable in certain patient populations, namely the “very-highrisk trauma patients”. Such patients are defined as the those who cannot receive anticoagulation because of increased bleeding risk or have sustained injuries preventing mobilization such as: i) severe closed head injury (GCS < 8) ii) incomplete spinal cord injury with paraplegia or quadriplegia iii) complex pelvic fracture with associated long bone fractures iv) multiple long bone fractures . Contrasting this, the American College of Chest Physicians stated in their 2012 Guideline on the topic, that there is no role for rIVCFs in primary VTE prevention . As expected from the lack of consensus amongst guidelines, there is variability in practice patterns throughout major American trauma centers [7,8]. The use of rIVCF in Canadian Trauma centers in unknown, reflecting the paucity of Canadian Trauma literature. One recent study from our centre highlights this, and provides evidence that effective follow up in an outpatient trauma clinic minimizes loss to follow up and improves low retrieval rates, an often cited limitation of rIVCFs . The objective of this survey-based study is to examine the current perception of rIVCF use for primary VTE prophylaxis in high risk trauma patients in Canada. The study was designed as an electronic survey of Canadian Lead Trauma Centre Medical Directors or delegates, and was approved by our local institution’s Research Ethics Board. The survey was a 19-point questionnaire distributed to a convenience sample of 16 Medical Directors of Trauma programs nationwide. Trauma Directors surveyed are of various training disciplines including General Surgery, Emergency Medicine and Critical Care. Study questions were designed to focus on three distinct categories: trauma center demographics and system structure; trauma center approach to VTE prophylaxis; trauma center perception of the role of rIVCF. All study authors were involved in question design and modification during 3 revisions. The survey was pilot tested by two of our local trauma care practitioners to ensure question clarity and adequacy of design. Study data were collected and managed using REDCap (Research Electronic Data Capture) tools hosted at Western University . REDCap is a secure, web-based application designed to support data capture for research studies, providing a) an intuitive interface for validated data entry; b) audit trails for tracking data manipulation and export procedures; c) automated export procedures for seamless data downloads to common statistical packages; and d) procedures for importing data from external sources. Survey response completion was successful in 14 of 16 centres, with all responders completing all survey questions. Centre demographics and answers to categorical questions are highlighted in Table 1. The majority of surveyed centres had protocols in place to approach VTE in trauma patients, and 100% of responders use LMWH as a first line agent. One hundred percent of centres surveyed have the capability of inserting a rIVCF. 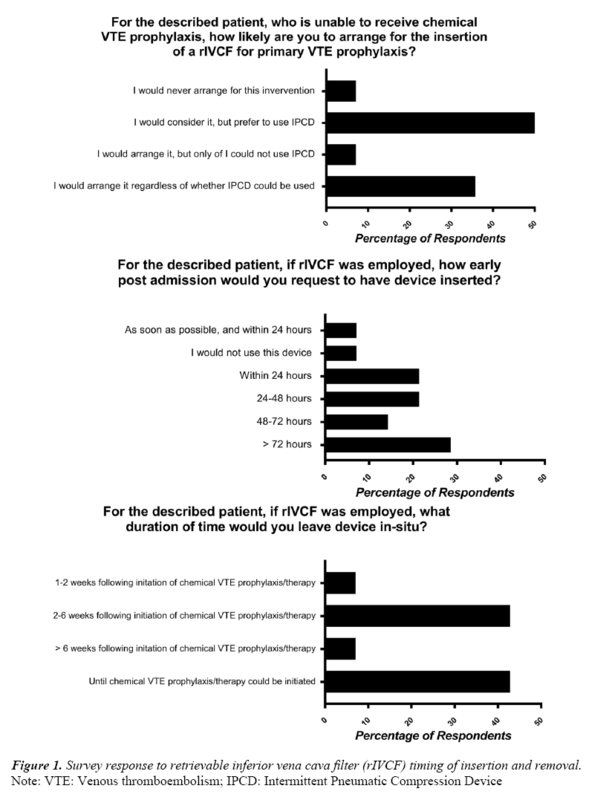 When asked the location and training background of who would perform rIVCF insertion, 100% of centres would have the device inserted by interventional radiology, in their procedure room. This modality was the most commonly deployed alternative for VTE prophylaxis in trauma patients in 21% of surveyed centres. Dedicated Trauma Service for admission? Trauma Clinic for follow up available? The EAST Guidelines regarding the use of rIVCF in trauma patients were included in our survey. When asked if rIVCF were placed in patients who meet EAST Guidelines for at risk trauma patients, Trauma directors provided the following responses: ‘Never’, 7% (1/14); ‘Rarely’, 50% (7/14); ‘Occasionally’, 28% (4/14); Frequently, 14% (2/14); Always 0% (0/14). When asked if other criteria were commonly used, only one respondent cited a Guideline (CHEST). Regarding use of rIVCF for high risk trauma patients, the following case was presented to participants: “A 28-year old male is admitted to your centre with traumatic brain injury and complex pelvic fractures following a high-speed motor vehicle collision. Imaging demonstrates a moderate sized intraparenchymal cerebral hemorrhage. VTE prophylaxis is withheld upon admission, and routine repeat imaging demonstrates interval expansion of the intracranial hemorrhage, precluding the use of medical VTE prophylaxis within 72 hours.” Responses to clinical questions surrounding this case are displayed in Figure 1. Sixty-four percent of responders (9/14) agree that there is sufficient clinical equipoise to justify randomizing high-risk trauma patients for rIVCF vs no rIVCF for use in primary PE prophylaxis. Table 2 outlines the agreement with statements surrounding rIVCF use and need for future research. Figure 1: Survey response to retrievable inferior vena cava filter (rIVCF) timing of insertion and removal. Table 2. Opinions regarding rIVCF use and Trauma research. Our survey demonstrates consistent use of LMWH in trauma patients without contraindication. However, variation in practice patterns regarding the use of rIVCF for primary PE prophylaxis in high risk trauma patients was identified. Though over half of respondents agreed that the risk outweighs the benefit for use or rIVCF for primary prophylaxis in trauma patients, the majority of respondents would agree that enough clinical equipoise exists to support randomization for a well-designed prospective trial. This is further supported by the answers to our clinical questions regarding timing of device insertion, removal and initiation of pharmacological anticoagulation displayed in Figure 1. The variation in reported clinical practice is not surprising giving the contradictory guidelines from EAST and CHEST regarding the topic [5,6]. The need for future investigation is also highlighted by a recent systematic review on the topic, where Haut and colleagues found a reduction in fatal and non-fatal PE with the use of rIVC filter, with no significant difference in DVT rates, or mortality . It is essential to note that there is large heterogeneity in the patient population receiving rIVCF, and the indications for which many of the current prospective trials have used rIVCFs are varied. Furthermore, the only prospective RCT examining rIVCF use found in the systematic review had over 90% of their rIVCF patients on pharmacological anticoagulation at time of device insertion . Further investigation of trauma patients unable to receive pharmacological VTE prophylaxis and deemed high-risk for development of PE is necessary, and was supported by 86% of respondents in our survey. The need for Canadian specific trauma research is also highlighted by our investigation and almost 80% of survey respondents agree. One previous Canadian trauma publication highlighted that marked geographical differences in access to Level I and II trauma facilities affected almost one-quarter of the Canadian population, who may not receive early resuscitation due to transport and system-based delays, a challenge that more populated American urban trauma systems (where much of the trauma literature is produced) may not share . The nature of a survey based investigation inherently carries limitations which warrant discussion. The small sample size reflects the relatively small number of tertiary care Trauma Centres located across Canada, as compared to the wide distribution across the United States. This survey involved questions directed towards each centre’s Trauma Director as an ambassador of other trauma practitioners. Though it was highlighted during the survey that we were interested in the actions of the ‘majority’ of trauma practitioners at each centre, it is conceivable that the answer of one individual may not reflect that of the majority. Furthermore, the Tertiary Care centers approach to VTE in at-risk trauma patients may be different than that of the community, however, in our Canadian Trauma system many of the described patients would warrant transfer to larger academic centers for definitive care after their traumatic injury. Nonetheless, one the goals of this survey study was to identify the presence or absence of clinical equipoise regarding the use of rIVCF for primary prophylaxis in Canadian Trauma centers, which has clearly been done. This Canadian based survey study identifies the need for further research regarding the role of rIVCF in our at-risk trauma patients. Currently, no prospective randomized trials have been performed examining rIVCF in at-risk trauma patients who are unable to receive pharmacological prophylaxis. One randomized feasibility trial published an interim analysis, however, almost all patients randomized to rIVCF had pharmacological anticoagulation initiated prior to device placement which would not be considered prophylaxis . Research in this patient population is a challenging task, yet a large multi-centered trial powered for safety and efficacy is needed to answer many of the questions regarding rIVCF use in at-risk trauma patients unable to receive pharmacologic prophylaxis. However, the logical next step would be initiating a single center randomized feasibility trial as proof of concept in the Canadian trauma population. In conclusion, this survey based investigation of Canadian Trauma Directors has demonstrated a variable use of rIVCF in high-risk trauma patients, and an interest in the development of robust, prospective research regarding the role of rIVCF for VTE prophylaxis in Canadian trauma patients. Author RMC participated in literature search, study design, data collection and analysis, and manuscript preparation. Authors KV and IB participated in study design, data collection, data analysis and critical revision. Authors WRL, AM, SK and NP were involved in study design, and critical revision. Authors RMC, KV, WRL, AM, SK, NP and IB declare that they have no conflict of interest. Geerts WH, Code KI, Jay RM, et al. A propsective study of venous thromboembolism after major trauma. N Engl J Med. 1994;331(24):1601-6. Owings JT, Kraut E, Battistella F, et al. Timing of the occurrence of pulmonary embolism in trauma patients. Arch Surg. 1997;132(8):862-7. O'Malley KF, Ross S. Pulmonary embolism in major trauma patients. J Trauma. 1990;30(6):748-50. Louis SG, Sato M, Geraci T, et al. Correlation of missed doses of enoxaparin with increased incidence of deep vein thrombosis in trauma and general surgery patients. JAMA Surg. 2014;149(4):365-6. Rogers F, Cipolle M, Velmahos G, et al. Practice management guidelines for the prevention of venous thromboembolism in trauma patients: The EAST Practice Management Guidelines Work Group. J Trauma. 2002;53(1):142-64. Gould MK. Garcia DA, Wren SM, et al. Prevention of VTE in nonorthopedic surgical patients. Chest. 2012;141(5):1369. Knudson MM, Ikossi DG, Khaw L, et al. Thromboembolism after trauma. Ann Surg. 2004;240(3):490-8. Rajasekhar A, Elmariah H, Lottenberg L, et al. Inferior vena cava filters in trauma patients: A national practice patterns survey of U.S. trauma centers. The American Surgeon. 2015;80(12):1237-44. Leeper WR, Murphy PB, Vogt KN, et al. Are retrievable vena cava filters placed in trauma patients really retrievable? Eur J Trauma Emerg Surg. 2016;42(4):459-64. Harris PA, Taylor R, Thielke R, et al. Research electronic data capture (REDCap)—A metadata-driven methodology and workflow process for providing translational research informatics support. J Biomed Inform. 2009;42(2):377-81. Haut ER, Garcia LJ, Shihab HM, et al. The effectiveness of prophylactic inferior vena cava filters in trauma patients. JAMA Surg. 2014;149(2):194-9. Rajasekhar A, Lottenberg L, Lottenberg R, et al. A pilot study on the randomization of inferior vena cava Filter placement for venous thromboembolism prophylaxis in high-risk trauma patients. The Journal of Trauma: Injury, Infection, and Critical Care. 2011;71(2):323-9. Hameed SM, Schuurman N, Razek T, et al. Access to trauma systems in canada. The Journal of Trauma: Injury, Infection, and Critical Care. 2010;69(6):1350-61.